Official artwork of Madama Butterfly from Bayonetta 2. Madama Butterfly, also known as the "Mistress of Atrocity", is a demoness from the Bayonetta series. She serves as Bayonetta's primary contracted demon partner. 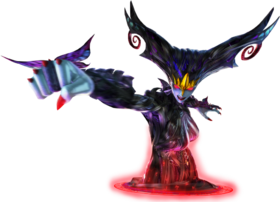 She, in exchange for Bayonetta's soul upon her death, grants Bayonetta her immense size and strength to aid her in battle. As a result of her pact with Madama Butterfly, Bayonetta is capable of performing Wicked Weaves, Witch Walk, and even grants Bayonetta temporary use of her wings when double jumping. Madama Butterfly battling Temperantia after being summoned by Bayonetta in Bayonetta 2. Madama Butterfly is said to be one of the most powerful denizens of Inferno, and is considered among its inhabitants to be a being worthy of fear and respect. It is said that any witch who forms a contract with her is granted immeasurable strength and wisdom. Not much is known about her in the first game, and even her face is left a mystery to those who do not own the game's official art book. Her role is much larger in Bayonetta 2, as Bayonetta goes from simply summoning her limbs to summoning her head and torso for powerful headbutts and body slams, and occasionally even summoning the demoness in her entirety to fight alongside Bayonetta against massive opponents. She additionally plays a minor role in the story - when Bayonetta ventures to Inferno to save the soul of her friend Jeanne, the demoness Alraune (who was responsible for Jeanne's death outside of her contract) initially shows little care that Bayonetta is intruding in her castle, but attacks Bayonetta upon discovering her connection with Madama Butterfly due to a personal vendetta against the stronger demoness. It is because of Alraune's rashness and desire to fight Madama Butterfly that she would eventually lose to both her and Bayonetta, freeing Jeanne's soul and being able to return it to her body. Bayonetta striking Madama Butterfly's fist in Ultimate. In Bayonetta's playable appearance in the Super Smash Bros. games, Super Smash Bros. 4 and Super Smash Bros. Ultimate, she can summon Madama Butterfly's limbs with her smash attacks (based on the Wicked Weaves from her source games). Madama Butterfly's wings also appear when Bayonetta double jumps, and her shadow takes the shape of Madama Butterfly. Madama Butterfly is also shown to be one of the Spirits in Ultimate. Full body artwork of Madama Butterfly from Bayonetta. Bayonetta using Madama Butterfly's wings in SSB4. Artwork of Bayonetta, Rodin, and Madama Butterfly as posted on the official Japanese PlatinumGames Twitter account. Madama Butterfly's Wicked Weave being used against Isaac's Pound Psynergy. This page was last edited on February 1, 2019, at 05:57.